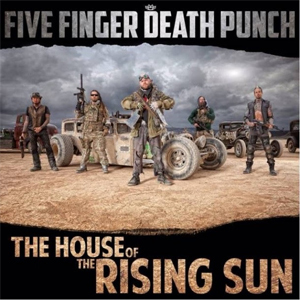 FIVE FINGER DEATH PUNCH Release Video For "The House Of The Rising Sun"
FIVE FINGER DEATH PUNCH, undoubtedly one of the most relevant and successful rock bands globally, dominated 2013, releasing their the two-part masterwork, THE WRONG SIDE OF HEAVEN AND THE RIGHTEOUS SIDE OF HELL - VOLUME 1 and VOLUME 2. Both volumes debuted on the Billboard album chart at #2 (more notably, within a four-month period), featured two #1 hit singles at Rock Radio (“Lift Me Up” and “Battle Born”) and have combined sales of close to 600,000 units (as of March 2014). The multi-million selling rock titans have now debuted the new video for their current single, “The House Of The Rising Sun”. Check out the video HERE. The gasoline-soaked cinematic video was filmed in the high deserts of Nevada, directed by the band’s guitarist Zoltan Bathory in conjunction with Thought Pirates Film’s Brian Neal, while Steve Darnell of the famous Welder Up Garage built the cars and handled the set design. Zoltan explains, “This video was an experiment, the initial step toward something we always wanted to do, which is to make a full-length DEATH PUNCH movie somewhere down the line. We jumped into this knowing that we’d shoot more footage than we could possibly fit in one music video. We went out there with two helicopters, two gyrocopters, twenty something crazy cars, a big cast and an arsenal of cameras. We ended up with so much amazing material, the hardest task was to compress it down into a 3 minutes video, so we made an extended version with a long intro and we are making an even longer ‘directors cut’ as we speak. The members of 5FDP discuss the single in a webisode on how they changed up the classic folk song to give it a hard-rock vibe, most notably, by switching the song's time signature from 6/8 to 4/4. Watch the webisode here: http://bit.ly/1cX5YeF. Zoltan adds, “The song’s lyrics are about gambling and drinking and we wanted to recreate those gun swinging outlaw poker scenes familiar from classic western movies, however I just couldn’t see us riding horses in the video so we shifted eras and went for a Mad Max-like post apocalyptic vibe with the cars and the bikes we ride anyway. We didn’t want any performance footage; the plan was to make the song sort of a soundtrack to a short story.“The House Of The Rising Sun” is currently climbing the Active Rock Radio chart and is at #18 as of March 24th. VOLUME 1 and VOLUME 2 were released via Prospect Park in North America and on Eleven Seven in all other territories and brought the band massive global success. VOLUME 1 (released 7/30/13)--features #1 single, “Lift Me Up” (featuring Rob Halford, legendary frontman for JUDAS PRIEST)--debuted at #2 in the U.S. (selling 113,000 albums in its first week), #3 in Canada and #4 on Germany’s mainstream charts amongst many other countries. VOLUME 2 (released 11/19/13)--features #1 single, “Battle Born”--debuted at #2 in the U.S., #6 in Canada overall and #1 on the Rock & Metal charts worldwide. Note: More festival dates to be announced.